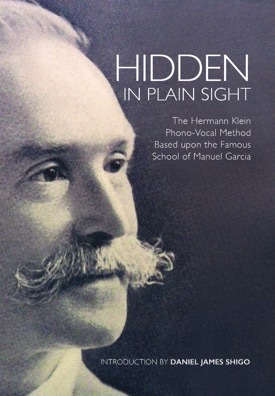 Frank Herbert Tubbs has appeared on these pages before, as well as in the introduction to Hidden in Plain Sight: The Hermann Klein Phono-Vocal Method based upon the Famous School of Manuel Garcia, where he was cited as having studied with Manuel García (whom Tubbs understood as having originated the teaching of voice placement in the "masque") and Francesco Lamperti. In the article below, Tubbs gives readers of The Voice a riveting account of his studies with the father of modern voice science—which, I must note, is rather unusual—first-hand accounts of García's studio instruction being more rare than once might think. In it, the reader observes García's condensation of principles, use of vowels to teach bright and dark timbre, correct method of breathing and vocalization, emphasis on tonal quality, word-sounding, and the ability to sing with one voice. As such, Tubbs offers the reader a remarkable document, if only because it contains information that is not found elsewhere. Tubbs' advertisement also appears in The Voice (which was later entitled Werner's Magazine). 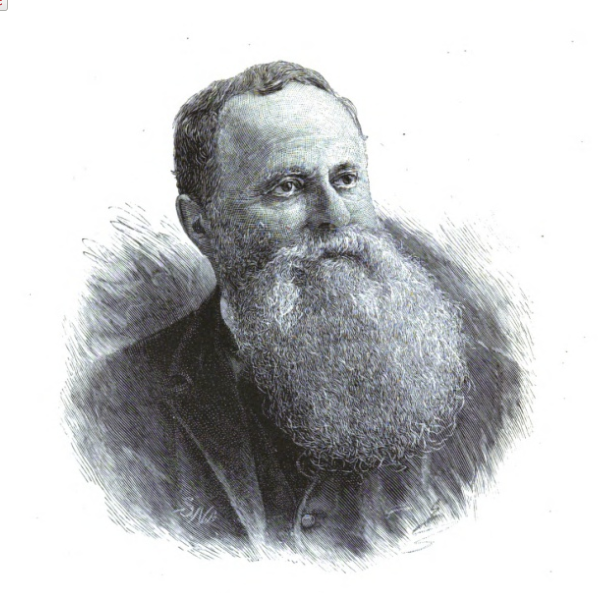 From it, we learn Tubbs had not yet studied with Francesco Lamperti, which took place sometime after January 1886—and before Lamperti's death in 1892. In America, thousands of miles away from home, the name of Signor Manuel García is known to every educated singer, and is familiarly known by last name. I called at the publishing house of Novello, Ewer & Co., in London and asked the clerk: "Can you tell me the address of Signor García?" (This gave me a shock! Could there be any but the Signor García?") Suppressing my indignation, I answered. The address was Manchester Square, which, being near, I sought at once. I found that he had abandoned his office and gave lessons only at his house. At first, no one was found who know where the house was; after a while, the manservant appeared who had assisted in moving, and he had the new address: "Cricklewood, Kilburn." Being a stranger, my next application was to a policeman, who pointed out the 'bus' to Kilbrun, "but as for Cricklewood, he new nothing about it." "Yes, this is Cricklewood, but we know no one named García." Call after call was made in street after street, and no one was found who could give the desired information, until the sun was declining in the west, making that mellow, golden light never seen outside of England. Then the postman, making his round, was observed, and from him the location of Signor García's house was found. Strange to say, it was next door to where inquiry had been made! Could it be possible? The next door neighbor did not know Signor Manuel García! Of what avail is greatness? Walking up the nicely-kept garden, and ringing the bell, brought the servant, who, after showing me into the drawing-room, summonsed "the master." He entered, drawing off heavy gloves as he came, for he had been pruning his fruit-trees in the orchard. It was with a feeling of greatest veneration that I stood in the presence of this man. He it was who first saw the vocal cords in their work, by means of the newly-discovered laryngoscope. There, before me, stood the man whose vocal cords were first seen, and I was to hear their tone. He it was who taught Jenny Lind and Bataille. Were I in the presence of a king, I could not feel more like bowing my head, than I did as I came before this man. He is small, compact and wiry, then (1882) 78 1/2 years old. The snow-white hair and mustache, and the piercing dark eye distinctly mark positiveness of mind, and the life and animation entering every word and action impress the visitor, even at first sight. In spite of the white hair, García appears much younger than his years indicate. Signor García condenses his voice-cultivation into five distinct subjects: (1) "Sure intonation:" (2) "same strength of tone;" (3) "same quality throughout voice;" (4) "meaning of text apparent;" (5) "perfect enunciation." The importance of these headings he impresses upon the pupil over and over. Upon examination, it will be seen that much is condensed therein. "Why do you sing so stiffly?" 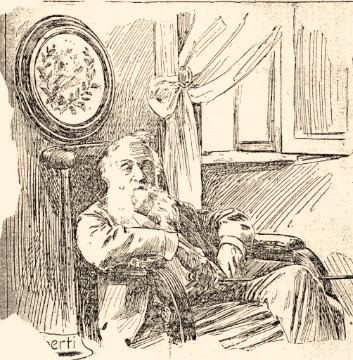 he would ask: "do you not realize that stiff singing indicates a rigid throat, and a rigid throat interferes with sure intonation and good pronunciation?" Or: "Do you not observe that continual explosive tone, the loud voice softened so suddenly, is because you have so little control of the respiratory muscles? Keep the same strength of tone." So it would seem that all the subjects and principles discussed and employed by teachers are condensed into but five by Signor García. That to which he refers most often is quality of tone, asserting that if the quality of tone is not good to our ear (provided our ear is cultivated), the voice is faulty in one or more of these great principles. The voice, according to Signor García, is "bright" or "dark;" or, to apply other terms, "clear" or "veiled." The "clear" quality is produced by lowering the soft-palate and raising the larynx, placing the throat in much the same position as when swallowing. The "veiled" quality is produced by reversing these positions,—that is, by raising the soft-palate so that the back of the throat and the roof of the mouth form an arched reflector; the larynx held low. These positions allow the extreme differences in the quality of tone. Between them are the various gradations of tone-quality and it is a principle of the method that the palate, pharynx and throat shall be so drilled that all may take, in response to instinctive command, that position which will produce the best and most appropriate quality which the meaning of the words demands. To this end, it is the custom of this master to exercise the voice with the Italian vowel a, first slowly and softly; and, as the muscles and membranes become more pliable and under control, more rapidly and with more fulness of tone. This fulness must never be allowed to become great in exercise-practice, and under no circumstances should a tone be allowed to sound harshly. The reason assigned by Signor García for using a in all exercise-practice, is because the tongue and throat are, while using this vowel, nearer their normal position (as in quiet breathing) than when using any other vowel. As strength and confidence come to the pupil he adds other vowel practice. He uses, however, the vowel sounds o and ee (long) for specific purposes; namely: the o for drilling the larynx to hold a low position, producing the "veiled" quality, and the ee for producing the "clear" quality by raising the larynx. "Practice! Practice! Time will make the quality alike throughout the voice." To illustrate: The question was asked: "What makes the 'bad note" at E or F of the tenor voice?" "The tones below the bad note are produced by the vibration of the whole glottis: those above, by the inner lips. Where the inner lips join the thicker portion is a little fatty substance, and it requires much practice to bring this into perfect vibration. But don't think anything about it. Practice will remove all difficulty." "Some people think, when they commence to inhale, that they must expand greatly the abdomen. Not so. The portion at the end of the breath-bone must push out a little when the breath is first drawn; but after the beginning of inhalation, the portion below the ribs should not expand much. The ribs at the sides should spread all they can, and the chest must expand fully. Then the lungs have all the air they can hold. While singing, be careful not to allow the air to rush out, but use it economically. Keep the quality of tone smooth. Don't allow the tones to begin loudly and suddenly die away. That shows loss of breath on them. Watch the tones the violinist produces. Hear how smooth all of them are. Hear how evenly the phrase of tones is made. Imitate that. While singing, select a good place for taking breath, and take all that is possible. Do not raise the shoulders in inhaling, for that crowds the throat-muscles, and this will not permit tones of good quality to be made. While singing, let the tones be peaceful and beautiful and the breathing will be good." Of course, when asked to describe fully the mechanical action required for the act of respiration, Signor García is ready to give the desired scientific information. It will be seen from the above brief summary, that strictest attention is to be given to producing a good quality of tone; that this good quality depends upon certain specified positions of the vocal apparatus, so drilled as to instinctively adjust themselves to express the meaning of the words employed, as fully as the intellect of the performer comprehends the meaning. 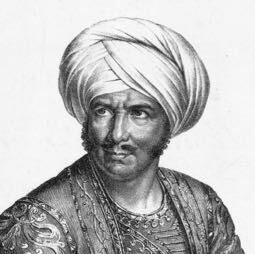 Additional to such drill as has been mentioned, Signor García uses practice in producing distinct word-sounding, and also, over and again, in studying an aria, appeals to the intelligence of the pupil, that he may better comprehend and render clearly the meaning. "Of what avail are good tones if you say nothing? Why should we merely vocalize before our audience? Give the meaning clearly and intelligently, or don't sing at all. What were we singing? Oh, yes! Now let us tell the story as if our hearers never heard it before and it is full of interest to them." He claims that if our tones have been delivered with a good quality before words are attempted in song, that our chief attention (while song-singing) may be given to consonant formation. "Do you realize," says he "how badly we would discover the meaning of a sentence were we to omit the consonants? So it is in singing. Here, if I write the vowels of this sentence, can you make out what it means? I will space them, too, as they belong in the sentence:"
Lips together as for pa, ba, ma. Lips and teeth together, as for fa, va.
Teeth and tip of tongue together, as for da, tha, ta. Tip of tongue and palate together, as for la, na, sir. Root of tongue and arcade together, as for ka, ga.
"Practice such exercises as will drill these parts to produce instinctively the right consonant sounds, without interfering with the quality of tone produced. Now our mechanical work is out of the way, let us study our arias." And the eyes of the grand old master would glisten as he turned to a loved opera or oratorio. The pleasure of writing of those pleasant memories must be deferred, for it is the purpose of this article to refer more to methods of mechanical drill than to the artistic portion of the teacher's work. One enjoys heartily the enthusiasm which Signor García uses while teaching an aria. Blanche Roosevelt has already appeared on these pages, which you can find by clicking on her label below. She was a student of Francesco Lamperti for a short time before transferring her allegiance to Lamperti's maestro—a certain Signor Trivulsi (also spelled Trivulzi) who had been grievously injured by a physician while employed as a court singer. Roosevelt sang for a number of years, most notable for the D'Oyly Carte Opera Company, before turning to literary endeavors and writing a book entitled Stage Struck, or She Would Be an Opera Singer—which is how the reader can gain something of her studies—albeit in the form of fiction. One gleans from the article below that Blanche Roosevelt had just begun her studies with Trivulsi, and knew something of the art of public relations, since the writer seems to be squarely in her court. The nice thing, of course, is that we are given a sense of Roosevelt's teachers and their vocal method. "Let us turn from a view of La Scala to the musical students, aspirants to the highest honors of the operatic stage, temporarily resident in Milan, to the maestri upon whom these latter are virtually dependent for the instruction which is, or at least so they believe, to enable them at some figure time to reap crops of diamonds and gather in golden harvest. The two principle teachers of dramatic singing who enjoy almost exclusively the monopoly of tuition in this branch of the musical art are, oddly enough, both octogenarians. One of them is an uneducated peasant, afflicted with deafness and a desperately bad temper. He has never taken the trouble to learn the Italian language, and conveys reproof, advice, and exhortation to his pupils in the Milanese dialect, which but few of them understand, and which is as unmusical a jog on as Platt-Deutsch. He vehemently deprecates intelligence and an inquiring spirit in his éleves, and refuses to have anything to do with them unless they will render him a blond and unreasoning obedience. "Non voglio teste sbagliate; bisogna ubbedirmi come un can'!" is a favorite axion of this agreeable old gentleman. He has invented a system, too, of producing the voice, which is one of the most remarkable discoveries of this or any other age. It is called the "Diaphragmatic Method." This theory is that the voice has not its source in the lungs—"nous avon changé tout cela," this modern Diatorius would certainly observe, could he speak French—but in, or under, the largest muscle in the human body. You must, according to him, draw up your voice from somewhere behind your midriff, and utter your note after expelling your breath from your lungs, not in the act of so doing, as would occur to the vast majority of human beings unversed in the diaphragmatic method. He also promulgates the surprised doctrine that you should breath into your bones to prepare yourself for the emission of a musical note. This part of his system is a mystery, the key to which I have hitherto failed to discover, though I have bestowed great pains upon seeking for it. Would-be singers are not, to the best of my belief, specially provided with bone connected with their breathing apparatus, like swallows or pigeons. Were this so, the problem of aerial navigation might be solved with more than lightening swiftness, and Signor Lamperti's pupils, by inflating the osseous framework of this bodies as a preparatory measure to the uttering of dulcet sounds, might find themselves in a position to perform a much more remarkable feat than the production of La or Sol can even be considered, whether these tones be evoked from the diaphragm or pumped up from the bones. Some excellent musical friends of mine here have the audacity to assert that this system is mere mischievous nonsense, the absurdity of which could be exposed in five minutes by any anatomical lecturer; but the maestro sticks to it, and finds it profitable. He nails his diaphragm to the mast, so to speak, and under that muscular banner obtains as many pupils as he can teach, whom he browbeats into the belief that they are inflating their bones when they really are only oxygenating their blood. Another singularity encouraging characteristic of this amiable theorist, in his quality as a teaching of singing, is he practice, whenever a new voice is submitted to his judgement, of declaring that the voice in question must first be utterly destroyed by his diaphragmatic method, and then built up again—I presume upon a body foundation. So far as the destructive part this view of his is concerned, he has indeed been triumphantly successful in the case of two or three particularly fine voices, belonging to young English and American ladies, which "the method" has annihilated. I only hope he may be enable to fulfill the remainder of his undertaking, and reconstruct them. 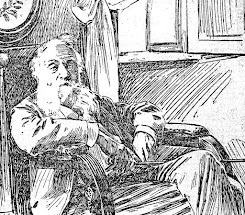 I am informed that the maestro, which has probably entered into some exceptional arrangement of Mr. Thom to centenarian principles, intends to transfer his class from Milan to London, where he proposes to make a snug little fortune in a few years, returning subsequently to Italy to spend it with his young wife. He is a strange being, and would, of a verity, be an interesting addition, persevered in spirits, to a museum of comparative physiology. The other great maestro, a jeune folâire of eighty-one, is a gentleman by birth and education, who pooh-poohs the famous diaphragmatic method, and stoutly maintains that all the singers he ever taught drew their breaths from their lungs, not from their bones. He is a kindly and encouraging, through struck, teacher; but he labors under the trifling disadvantage of being a confirmed paralytic, which dies a little interfere with the business of instruction. He gives his lesson in bed, and is visited by short spasms at irregular internals, which at first prove highly disconcerting to his female pupils. 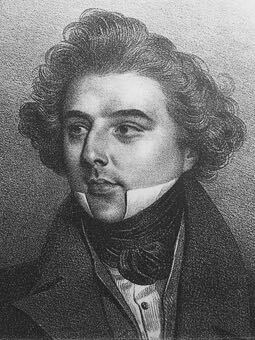 Thus, of the two great Milanese maestri on the stage of the lyric drama, one is deaf and the other smitten by paralysis; one is short-tempered and too often rude, the other is invariably de bonne humeur, and polite to a fault. The one as a "method," the benefits of which can only be acquired at the expiration of a two years' course, as it takes the most assiduous pupils twenty-four months to learn how to breath through her bones and evolve musical sounds from the pit of her stomach; the other is content with imparting the methods of better mend than himself, stet super atiquas vias, teaches as it were au jour le jour, and does as much for his pupils as his incurable malady will let him. Such are the two mighty singing-masters of Milan, the great-grandfathers of song, under whose rival banners are ranged some scores of "coming celebrities," among others, of less notes, Miss Blanche Tucker, alias Bianca Rosavella, who is engage for next season at Covent Garden, and will probably make her début in the rôle of Gretchen—for which, as fas as her physique is concerned, nature has qualified her in a very unusual and striking manner. This young lady has recently transferred her allegiance from the diaphragmatic to the paralytic maestro. She found that "the method," besides damaging her voice, did not agree with her general health, so she went over to the other master, under whose milder sway she is rapidly recovering. 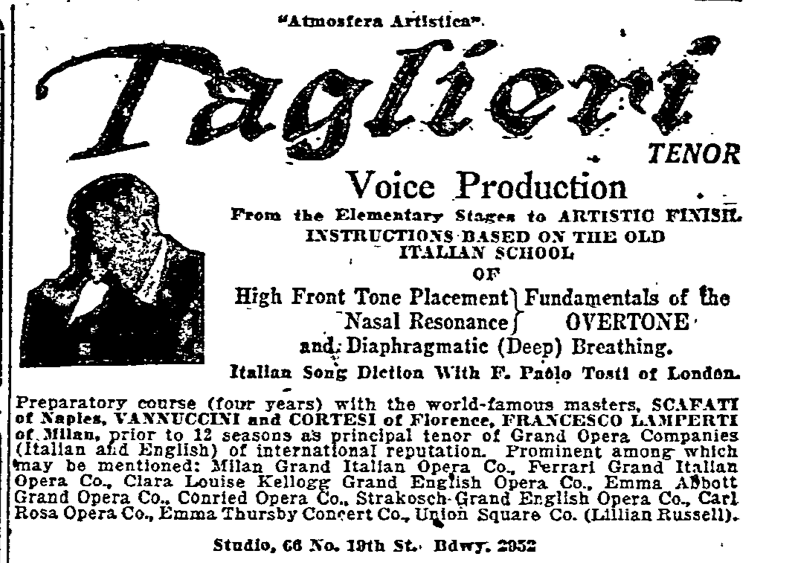 George Tyler was a dry goods clerk who—by virtue of his resonant tenor voice, went to Italy, studied with four Old School voice teachers—Francesco Lamperti among them, and became Gio Tyler-Taglieri. He sang for a about a decade with many famous singers, and then taught singing in Portland, Oregon. The little that I have been able to ascertain about him is not as revealing as his advertisement which appears with just enough pedagogical detail to make one think. Instructions based on the Old Italian School of high front tone placement? Fundamentals of the overtone and diaphragmatic (deep) breathing? 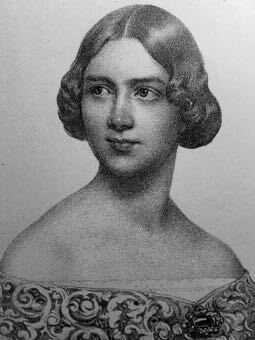 Taglieri's teaching was also that of Anna E. Schoen-Rene—a student of Pauline Viardot-García and her famous brother Manuel García. Ubiquitous baby! 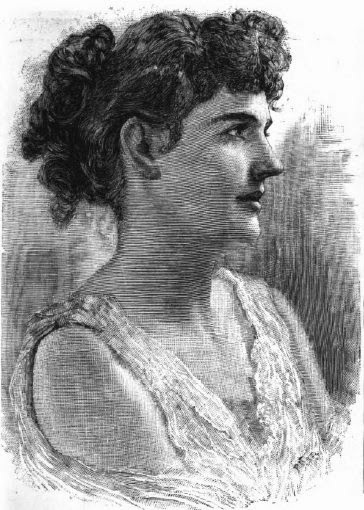 Among the teachers of singing who have yielded to the irresistible spell of Berlin and transferred their sphere of activity to the Prussian capital is Madam Schoen-René, late of Minneapolis. This growing Western Metropolis has claimed her for seventeen years, although she is by birth a German, and received her entire musical schooling and experience in Europe. As a young girl she was a pupil of Frau Schulze von Asten, one of Berlin's most conspicuous pedagogues and herself a pupil of Madame Viardot-García. Further instruction from Ferdinand Sieber and the older Lamperti—both exponents of the García method—so convinced Madame Schoen-René of the absolute efficacy of these principles that she went to Paris and put herself entirely in the hands of Madam Viardot-Garcia. By this distinguished maitresse du chant Madam Schoen-René was prepared for an operatic career, but, notwithstanding the fact that she met with the most flattering success on all the large metropolitan stages, she yielded to her strong pedagogical instinct (which has alway sheen very pronounced in the Schoen family) and decided to devote herself entirely to imparting the principles of her great teacher. So successful has she been that Madam Viardot-García recognizes her officially as one of the exceptional representatives of her method, an opinion shared by the old Manuel García, to whom Madame Schoen-René went for special treatment of men's voices. It is quite characteristic of her conscientiousness and sincere attitude toward her work that she should have given up her class in Minneapolis and made the trip to London in order to hear the advice of the great García on this point. Madam Schoen-René claims no new method, as her work is based solely and singly upon the García principles, which mean nothing more nor less than the expression of bel canto in it purity, and not the retouched "old Italian method" about which one hears so much now-a-days. She has not attempted to add or subtract anything from the ideas gained from this source, and Madam Viardot-García wittily says: "Your pupils have a right to be called our grand children." In emphasizing this point is is not meant to convey the impression that Madam Schoen-René is only a specialist in tone-building. She herself says: "I do not wish to be classified either as a tone builder or as a coach, but as a musician! Proper tone production is the only possible means of securing proper phrasing and coloring, and to separate the technic of the art from the musical expression of the same is an impossibility. When I once used the term "coach" in Madam Viardot-García's presence, she held up her hands in holy horror. If such a separation of these two fundamentals essentials of artistry were possible, then piano teachers and violin teachers might as well claim to divide themselves into "tone builders" and "coaches." No such thing is possible! This is my musical creed! It is not necessary to mention what Madam Schoen-René has done for music in America, as that has been officially recorded in the year book of Minneapolis. She was the first to bring to the Northwest the German Grand Opera Company, and has done much towards molding musical sentiment in the Northwest by giving the public an opportunity of hearing repeatedly the world's greatest artists, all of whom are her warm personal friends. In deciding to make Berlin the headquarters of her International School of Singing in the future, Madam Schoen-René was influenced by the consideration of being near her pupils already established in their operatic careers, and being accessible to those who are working up their repertoire. A singer from her studio can always obtain a hearing from the leading managers and agencies, as the latter realize that the artists recommended by her will be exactly as they are represented. At present she has pupils singing on five operatic stages in Germany. These are George Meader, of Minneapolis, who is one of the lyric tenors of the Leipzig Opera; Marcella Craft, who is singing light dramatic roles in the Royal Opera in Munich; Alice Torereiger, who's is making a phenomenal first season's record in Posea; Frl. Daniela, dramatic soprano of the Volksoper in Vienna, and Herr Tramsch, leading baritone of the Royal Opera in Darmstadt, who, in his first season is singing the heavy roles of "Flying Dutchman" and "Wotan," Mrs. Timmers, of Los Angeles, who is said to have a glorious mezzo-soprano, is now finishing her German repertoire in order to begin active work next season. Dr. Augustus Milner, who has been singing with success in America, will soon come to Berlin to be prepared by Madam Schoen-René for a German operatic career. In America her pupils occupy everywhere positions of responsibility, both as singers and teachers. In order to give her pupils still further facilities, Mme. Schoen-René has prevailed upon Frau Louise Reuss-Belce to come to Berlin every week in order that those studying for opera may have the advantage of lessons in dramatic art from this exceptional equipped teacher. Frau Reuss-Belce is the well known Fricka of the Bayreuth Festival, and it is upon her shoulders that the mantle of Frau Cosima Wagner has fallen, all of the Bayreuth singers being prepared in their dramatic woe by Frau Reuss-Belce. With this increased facility the students from the Schoen-René studio will be prepared to enter at once upon an active operatic career. —The Musical Leader and Concert Goer, December 22, 1910. Leo Kofler had a long thirty-career as organist and choir director at St. Paul's Episcopal Church in lower Manhattan where he was much respected by his peers and the Press. He then moved to Morristown, NJ, where he played at the First Presbyterian Church for three years before shooting himself in the mouth with a gun while suffering from "melancholia." That Kofler's illness coincided with his forced resignation from St. Paul's after a newly installed clergyman favored a younger organist should come as no surprise, examples of his circumstance—plus or minus the suicide, being plentiful. But I digress! 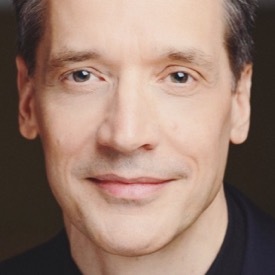 Many years earlier, Kofler had renounced his calling to the Roman Catholic priesthood in Germany, and before that, had been a famous boy chorister trained in the principles of the Old Italian School. Is it any wonder that his first book on vocal pedagogy traced this school's long presence within Germany? Kofler's historical perspective on vocal lineage is one of the main features of The Old Italian School of Singing, as are his thoughts and instructions on breathing, which were later expanded in The Art of Breathing. Students of vocal technique will note his insistence on nasal breathing and suspension of breath, which was shared by many other Old School teachers of his time, notably Pauline Viardot-García, whose instructions on nasal inhalation appear on the first page of An Hour of Study. Considered part of a pupil's first studies, Kofler laid great stress on breathing as well as the equalization of registers, messa di voce, portamento, and distinguished diction. Kofler's beard and short-trimmed hair? You can find this look on young men walking Manhattan streets in Armani, bespoke shoes and chunky glasses. Radicals in suits, they enable us to see old things in a new way, which is what Kofler endeavored to do in the 1880's when singing teachers were besotted—as they are now, with anatomy, physiology, and the inner workings of the larynx. There they stand in broad daylight, these two great lighthouses of the pure Italian school—Tosi at the beginning of the last, Sieber in the middle of this century as out teachers, as our guides. All that the historians of Italy, Germany and France and England tell us of the principles of this school, of the wonderfully-trained voices and artistic success of the pupils, all that the great bravura-arias claimed from the singers, all that the immense literature of solfeggios prove to us—shown up to the light of those two great works, proves to be the genuine article. And when we compare all that is good—and there is a great deal of it—in the various works which we have mentioned from our own days, with these two great vocal guides, then we come to the well-established conclusion that nothing—absolutely nothing—can be found of theoretical and practical principles as the result of careful, scientific study, by vocal teachers capable of cultivating a voice to its highest perfection,—once more, and emphatically let it be marked, nothing—absolutely nothing that is good can be found, except it has been handed down from the first great masters and their pupils as a living, and sharply-defined tradition to our own days. Note it once more, this tradition was the only practical way of preserving the great principles of this celebrated school. No doubt many of the masters—especially the most celebrated ones—were very original men. Yet they stand confidently by the flag of their mother-school—for their method belonged to that school. The originality consists simply in their practical application of these principles. An original method can only mean the ruin and spoiling of the old great one; but the original way of applying the established principles to individual voices calls forth the greatest study and originality of a teacher. That is not a new method—simply proof of qualification to be a teacher, a sign of the great talent for teaching. Always breathe through the nose while singing." "Look twice at the most favorable operatic contract. Only phenomenally strong voices can endure the strain of singing in opera oftener than twice or three times per week." "As to the larynx—do not do, but let it be done by the automatic influence of the breathing-muscles." TO LOOK at Mr. Leo Kofler it is hardly possible to believe that twenty years ago an insurance company was so sure that he was going to follow five sisters, one uncle, an.aunt and a grandfather along the crowded path of consumption to the grave-yard that he could get only a policy of $1,000 at the enormous premium of $54.26 a year. He himself had shown many symptoms of the disease. He caught colds frequently and they almost always settled in his lungs. In spite of an abstemious life, his digestion suffered and he was almost chronically bilious. But he did not wish to die, and so he set himself to fight death off as long as he could. He took lessons in elocution; he studied all the books on breathing that he could get hold of and now he says, "Whatever I die of when my time comes, it will not be consumption." He is sure that correct breathing is what has preserved his life and has made him so hearty. Mr. Kofler has an illustration of the value of laryngoscopy to the teacher of voice-culture that is characteristic of the man. He takes out his watch and shows you the face upside down. "Could you learn from that how to make a watch? No? Neither can you learn voice-training from looking at the top of the vocal bands. What is beneath? Even if you could know exactly what goes on in the larynx of one singer, it might be wrong to make every other pupil do the very same thing. No. It is not this [pointing to his eye], but this [pointing to his ear] that must be the teacher's guide. I do not say that it is not worth the while of the investigator of vocal phenomena to pursue laryngoscopy, but it is not worth the while of the teacher of voice-culture. To the pupil, it is not only absolutely useless; he should not think for an instant of what the larynx is doing. He should not try to make it do this or that. You know how it is with the tongue. Tell a pupil to let his tongue lie flat in his mouth; he draws it back till it dams up his throat. Not until he takes a looking-glass and finds out what he is about can he learn how to do what he wishes to do with his tongue. But how can he look at his larynx? The whole throat ought to be free from the influence of the will-power and left under the automatic influence of the breathing- muscle, the diaphragm. Tone-production is not controlled by the throat, but by the breathing apparatus. "Singing is divided into two sections. First, there is tone-production as from any other musical instrument. Second, there is the reinforcement of this tone on the resonance-cavities and the formation of words. No other musical instrument has a language. That is a vital point, all too little considered. The will-power influence in tone-production must be centred in the breathing, so that the throat is left free to respond to the automatic influence of the diaphragmatic action. As to the specific words, the will-power must express them and the sentiment embedded in them by means of the movable parts of the resonance-cavities." "Do you have the pupil practice respiratory exercises without making tone?" "Without doubt. Why does a singer need breathing-exercises? Simply because he can not afford to do without them. No one can sing without needing a great deal of breath and without being able to control it. Breathing-gymnastics not only increase the capacity of the lungs and call into use cells that would otherwise lie shrivelled up and never expand to their full size, but they strengthen and limber up the breathing muscles and give facility of control. Not only do I give exercises of inspiration, but, what is most important to the singer, exercises in expiration so that the breath taken in may be let out as gradually as is dedesired. It is the lack of control of the breathing-muscles that floods the voice with breath." "Some teach that when a tone is made, the abdomen should round out; others teach that the chest should be lifted and the abdomen should press in to expel the breath. Which is your method?" "The abdomen flattens to expel the breath. The other method I should consider particularly dangerous to women. This is the whole process of taking and emitting breath during singing: Take breath with considerable energy through the dilated nostrils, expanding the region of the waist and at the same time feel a slight expansion of the whole breathing-apparatus from the collarbone to the lowest point of the abdomen. Continue taking in air, expanding the whole circumference of the trunk in a complete oneness of action and, at the last moment, without overcharging the lungs with air, by raising the ribs, push up the collar-bone, drawing the shoulders slightly backward and pulling the lowest part of the abdomen slightly inward. "Hold the breath a little while. "As you let the breath escape very slowly, hold the chest firm to the last; by a stringent, antagonistic action of the lower abdominal muscles press the lower abdomen inward and upward very gradually and finally draw in slightly the region of the waist until all the breath as far as it can be used is exhausted. Then allow the chest and abdomen to return at once to their former condition of repose. "Some call this diaphragmatic breathing. What breathing is not diaphragmatic? Is it abdominal breathing? It is more. It is intercostal, clavicular and all. It is a full breath." ''You apparently believe in holding the air in the lungs a while, neither inspiring nor expiring. What is the good of that? What is the maximum period for holding the breath so?" "Always hold the breath a little while before using it in song or speech otherwise some of it is lost between the taking of the air and the starting of the tone. It is good for the health. It is like opening the doors and windows for a moment to let the fresh air into a close and stuffy house. There are many little air-cells in the lungs that would not be expanded to their fullest for weeks together unless the chest is distended to its fullest capacity and held so for a few seconds. From the earliest ages physicians have recommended the practice and in some religions holding the breath was a ceremony counted beneficial to body and soul. Kant, the philosopher, even wrote of certain diseases that could be dispelled by holding the breath. In singing it has been noticed that it is easier to let the air out of the lungs more evenly and economically if it has been held a few seconds before being expired at all. Thirty seconds is the limit of safety in holding the air as hygienic practice. More than that is unnecessary and even dangerous. Up to that point it is a healthy practice and a good test of lungpower. Normally one inhales breath and immediately lets it go, but in singing there are phrases that must be sung in one breath that often last fifteen or twenty seconds, during which time one must defer gratification of the impulse to take in fresh oxygen. It is well to practice exercises that will inure him to this necessity of doing without new air." "Do you give drills for the respiratory muscles without breathing?" "No, never. I am sure it is absolutely useless, and my private opinion is that it sets up bad habits. If it has done anybody good, I'd like to hear of it. How can you use the respiratory muscles without taking breath unless you hold the nose and mouth shut? Perhaps you use the surface muscles instead, but then you do not build up the lungs or increase the size and strength of the chest. Any how what is the harm of taking breath? Is there danger of overworking the lungs?" "Do you make any difference in the respiratory drills for men and for women?" Not at all. The normal man and the normal woman breathe exactly alike. What difference exists between the respiration of the sexes is artificial and caused by costume. Now, do not think that I begin to argue with a woman and tell her how irrational is the corset and the tight waist. I might talk till doomsday and she would not be convinced. (I ought not to tell you this, for it is a kind of professional secret.) I employ the argumcntum ad mulierem. You have heard of the argument em adhominem. It is in plain English: 'Try it on yourself.' Well, I explain to my pupil how I want the exercises done at home without any encumberances whatever about the waist and ribs, not even a belt. The chances are that the girl has not know the luxury of a full breath since she was a little girl. Her lungs expand with the daily practice and by-and-by she can't stand it to wear anything that cramps her breathing. Then good-bye corset. She finds that she is able to hold herself up without props. Nowadays women are more sensible about such things." "You spoke of daily practice. Do you allow your pupils to practice by themselves?" "I certainly do. I make very plain to them, step by step, what I want them to do and besides my book I give them a sort of composition book or account-book in which I write the points of each lesson. If a pupil does not learn to be her own teacher, of what use is it for her to take lessons? Only in exceptional cases do I think it might be necessary to forbid them to practice by themselves and those will never learn to be singers. It is only parrot-work when the pupil may not use her own judgment and must copy only what the teacher does. Imitation is child's teaching. As to the length of the practice time, it varies. A beginner should never practice longer than ten or at the most fifteen minutes at a time, three times a day. She should never practice within an hour after a meal. If in good health, I see no reason why she should not practice before breakfast. So long as only soft exercises are to' be done, the pupil may increase the time to twenty minutes in a couple of months; in four months the time may be increased to thirty minutes and ten minutes extra may be given to the swelling out of the voice on sustained tones. At the end of a year the ultimate length of time may be reached, forty-five minutes three times a day, with ten minutes extra on swell-tones.I advise that they always wear the loosest dresses, seldom play their own accompaniments, stand straight, do not allow the head to bend forward or backward. Keep the pitch by striking the key of the piano once in a while with the left hand but do not become a slave to the instrument. Learn to take the tones independently. If they must play accompaniments, they should sit on as high a chair as possible and not far back on the seat. This will give the abdominal muscles more freedom." "Do you have the pupil breathe and sing in various positions such as might be required in dramatic situations?" "I do not, because I think it is a dangerous thing for any except those possessing phenomenal voices to appear in opera. The ordinary voice can not stand being used in all the postures required by intensely emotional music-drama, with the head bent down as in humiliation or thrown back as in supplication, etc. If it can be done without bending the head upon the neck stooping only with the backbone, not so much harm is done. To express the violent emotions with a cramped or relaxed throat, which must be the case if the performer has any sense of the dramatic requirements, is also destructive to the voice. Very few operatic singers last long." "Patti was the reigning queen of song, an absolute monarch. She could do as she liked. If she did not choose to sing, she did not sing. She took the utmost care of her voice and let nothing stand in her way. But there are not many Pattis. A concert singer may appear every night and if her voice shows signs of wear, then there is something-wrong with her method. Three performances a week of the leading role in any opera are the extreme limit of safety. Two performances should do no harm to one in good health. There is also to be considered the question of proper food and rest. Eating at different hotels, having to live in one's trunk, as the saying is, and traveling about in sleeping-cars is wearing on the health and nervous strength. A singer that wants to preserve her voice should look more than twice at the most favorable operatic contract ever written. The parts may not be fit for her voice, her talent or her physical powers. She will have to sing too many times a week. She will sing when she ought not to, because she is jealous of a rival, or because she wants the money, or because the management compels her to. Take the Castle Square Company as an example. In the early part of the season the performance was quite creditable. I went one evening toward the end of the season and I was obliged to get up and go out. The voices of the principals were tired and worn so much that it was painful to me to listen to them. No. I don't encourage my pupils to look forward to an operatic career." "Has the term 'pure tone' any test other than the standard of each individual?" "Each person has a face of his own that more or less departs from the standard of beauty. Each person has a voice of his own that likewise departs more or less from the standard of beauty, even in its best condition. There must be, it seems to me, a specific tone for each individual and purity of tone must be as surely an ideal as beauty of form and color. Those who profess to have a test for purity of tone with instruments I believe to be putting on scientific airs. I was present at a test of that kind once. The demonstrators had resonators, stringed instruments, tuning-forks, etc., and talked and talked. Finally, out of patience, a teacher demanded: 'Let us hear! Let us hear!' That is our test. Well the tones that were pronounced to be scientifically pure were ghastly things to hear. Madame Seiler was about the first, I think, to advocate the test of the overtones in the human voice. I heard a young woman pupil of hers, certificated as being a competent exponent of the method. The so-called 'pure tone' was the most sepulchral imaginable. Madame Seiler was accustomed to use the vowel oo in order, as she said, to place the voice well forward. I think it was admirably suited to misplace the voice. You can place a ray of light, for that goes straight. But sound travels in waves and how can you place waves? To be pure, the voice must be free. It must not be cramped or shut in. But oo is the next thing to a consonant and impedes the free outlet. For myself, I usually begin with a, as in father. If that has a tendency to stiffen the throat, I use another vowel. I even use soft humming exercises to get rid of the cramping of the throat and the stiffening of the jaw. But the humming must be done softly lest it develop a nasal habit. I am not one of those that think too highly of the nasal quality. For the vowels nasal resonance through the bridge of the nose is unnecessary. Shut your eyes and I will sing vowel tones, part of the time with my nose pinched shut and part of the time open and you can't tell which is which. The forward nasal cavity is needed to reinforce m and n, but when it reinforces vowel sounds it is then a fault." "Do you try to exercise the soft-palate?" "Certainly. A lax condition of the soft-palate is what makes a whining, unpleasant nasal tone in the speaking or singing-voice. If the uvula is abnormally long, a surgeon should attend to it; but where it is simply flabby and lax exercise on the vowel aa will tone it up. It varies its position with the different vowels, and so it is necessary to have it under control. This is one of the exercises I give. Stand before a mirror, take breath through the nose, open the mouth wide, hold air a little while, and with the handle of a spoon (if you haven't a tongue-depresser), press down the tongue as far back as you can without gagging and sing upon the vowel aa as long as the breath lasts a tone of the medium range. Do this several times in succession. At the same time direct the will power toward the uvula and softpalate so that they may lift themselves up and back against the entrance of the post-nasal tube Simple inhaling will not exercise the uvula. It rises automatically and hence acquires no strength by so doing." "The seeking after them is what we Germans call: 'Effekt-has-cherei,'—a hankering after sensationalism, a running after showy things. A very high tone ceases to be human and becomes something like a piccolo or the note of a bird. It is mere bravura, a piece of display and not an expression of emotion. A good high tone, natural to the voice is valuable, but that is a different thing from 'made' or forced high tones. The effort to attain to such altitudes is ruinous to voices. What is the use of getting them at such a sacrifice? Nevertheless, when they are in the voice, they are to be developed by exercises of arpeggios taken lightly and staccato. But the wish to have them does not imply that they are there and the greatest care should be taken by the teacher in classifying the voice of the pupil. If a mistake of judgment is made in the first place, the teacher should not hesitate to say: 'I was wrong in my estimate.' It is hard to admit that one is not infallible, but to go on stubbornly refusing to correct a mistake in the classification of the voice, is criminal. The pupil may seem to have a tenor voice because he wants to be a tenor and mimics the quality of that voice. One of my pupils appeared to me to be a mezzo-soprano and I was deceived for some time. She was really a deep and full contralto but imitated her mother, who possessed a beautiful mezzo-soprano. "Distrust those teachers that profess to be able to extend the compass to extremes. The full use of the natural capacity is all that the best instructor can give. To attempt to go beyond nature is to impair the organ. After all, it is the middle part that is the most valuable. Threefourths of the work in a song lie there. It is therefore the business of the pupil to endeavor to acquire beauty and freedom of expression in these tones rather than to sacrifice them all for the sake of a few high notes merely to make people stare. There are teachers that say: 'I made that voice. I made it.' What nonsense! No teacher can make a voice. He can look behind the faults and see what causes them and then show the pupil what to do to remedy them, but he can not make a voice where none exists. If it is small for natural reasons, he can not make it great. If she has small resonance-cavities, small larynx, thin vocal bands, what are you going to do?" "Always breathe through the nostrils." "Even in the middle of a song?" "More especially then than ever." "But can one get enough breath in a quick inspiration through the nostrils?" "And not make an unpleasant noise?" "Not so unpleasant as if it were gasped through the mouth. Listen." "Everybody agrees that the air we take into our lungs and over our vocal bands should first of all be warmed and filtered by the nostrils. It is well-known that cold air gulped in through the mouth causes sore throat. If you sleep with your mouth open all night, in the morning your throat is parched and feverish, you have nausea and headache and feel thoroughly miserable, a proof that you have been doing something bad for the health. So injurious is the practice of mouth-breathing that children that have that habit grow up feeble-minded. The nostrils are the defences of the delicate membranes of the throat. The two narrow tortuous channels of the nose are fringed with bristling hairs that sieve out the flying particles of dust and the air is warmed to a temperature that makes it respirable by the lungs without danger. During singing it is particularly essential that the vocal bands should be protected from anything that would irritate them and yet all teachers agree that it is impossible to breathe through the nose at this critical time. They say that it is impossible to get enough air and that the disagreeable sound of sniffing can not be avoided. They would agree that it would be well if nose-breathing were possible. But it is possible. I got all the breath I wanted and I could have avoided making that noise if I had directed my attention to it. Anyone can learn to do it with a little trouble and surely the trouble is worth taking if it will preserve the voice. It is easy enough, when you know how, like a good many other things. You remember what I told you about the tongue. I said that pupils usually did exactly the opposite of what they were told to do with it, and that they have to look in the glass to find out what they were about. It is so with the nostrils. When one thinks of expanding the nostrils, he contracts them because he tries to do the same thing as smelling a flower. But when one inhales an odor, he contracts the nostrils so as to direct the current of air against the olfactory nerves. He narrows the opening instead of widening it. Be assured that in all songs there is as much time to draw the air in through the nostrils as there is to draw it in through the mouth. Nose-breathing in a song is like Columbus making the egg stand on end. First it is impossible; then, everybody can do it, a soon as he knows how to do it. "Do you practice the 'direct attack,' that is, have the breath and the tone come together, or the 'indirect attack,' that is, have the breath open the glottis first and the tone follow?" "Under no circumstances should the breath in singing go without the tone, except of course in dramatic music where the tone is strongly aspirated to show passion. The tone and the breath should be absolutely together; no slurring, sliding or scooping, no hammering either. The tone should be distinct without being harsh or swimming in breath. This is what I seek for my pupils. • It is also of as much importance to know how to quit a tone as to attack it. Some singers show great ingratitude; they kick a tone out of doors as soon as they have done with it." "Should the larynx be fixed or movable?" "You must not do anything with the larynx: rather let it be done. The breathing-muscles and the tongue-muscles control the up-anddown movements of the larynx. Those who say that it must be held thus and so are wrong, for the test of tone is not the eye but the ear. By their fruits ye shall know them. When their exemplars sing you want to stop your ears. There are so many ways of doing the same thing that it is hard to say in advance which is the right way. Theoretically it may be just the thing but the practical way to find out,is to hear how it sounds. The proof of the pudding is the eating." "I give it up. I know what 'falsetto' is when I hear it, but I can't describe it to you or tell how it is made. I have read many physiological descriptions, but I can't make out whether it is produced by the vibrations of only the edges of the vocal cords or by the action of the resonance-cavities. Perhaps it is both. The post-nasal cavity has something to do with it, that's sure, but I can not follow the tone in laryngoscopic observations no matter how much I have tried. I don't know what the 'falsetto' is, physiologically and I don't think anybody else knows." "You haven't said anything so far about 'the natural method' and 'nature.' Why not?" "I don't think the use of these terms gives any clear idea of what is meant. 'Natural' is often used as a synonym for 'habitual,' which may be very unnatural. I don't use the terms because it is a waste of time. I don't subscribe either to that school that talks about 'nature being so beautifully simple.' It is my experience that nature is tolerably complex, not to say extremely difficult to see through. The human voice simple? It's the most complex of musical instruments. Of all manmade instruments, the grand organ is the most involved, but it is simplicity itself compared with the voice. All its mechanism of bellows, actions and pipes is easily comprehended. You can get in and look at them. You can take them apart and mend them, when they go wrong. But you can not see into the larynx at all when it is working normally. You must distort the mouth and pull the tongue forward and put a mirror against the uvula so that the oral cavity is certainly out of shape and presumably the post-nasal cavity and even the larynx itself. From the dissected larynx there is little to be learned. Take the pipe-organ apart and it is still there, for you can put its rank upon rank of pipes back again. Take the voice apart and—you have no more voice." "In your teaching do you say: 'Don't' or do you say: 'Do.' Don't you think that calling attention to a defect sometimes intensifies it?" "When pupils do a thing wrong, I say, 'Stop!' I want them to know that they are wrong. Then I tell them what to do and how to do it." "Suppose one comes to you unable to sing in tune, what do you do?" "Do you believe in State supervision of singing-teachers as of physicians and lawyers?" "Indeed, I do not. It is absolute nonsense. If the qualifications of a singing-teacher were left in the hands of the politicians, we should be worse off than we are now. There would then be no honesty in the profession. I do not mean that there would be no honest men left in it, but I mean that as a profession it would be degraded. The worst humbugs would be certificated as well as the most competent. How could that be? By this [rubs thumb and finger together making the gesture that stands for bribery]. Even in the great European universities there is no chair of vocal culture. No. It is a madness that comes over people that impels them to put everything into the hands of the government, instead of having faith in the ultimate victory of common sense and honesty of the people." "Have you any theory as to the part that the 'false' vocal cords play in the production of tone? " ''As the devil said of the pig, there is much cry and little wool. What are they for? What are the tonsils for? The less one thinks of such matters the less trouble he will have." "How do you define the terms 'throaty,' 'breathy,' 'open tone,' 'covered tone?'" "By 'throaty' I mean the tone produced when the muscles of the throat are cramped and constricted; by 'breathy' I mean that the singer wastes breath when he produces tone. A 'covered tone' is one in which more than one kind of resonance is used, as the head and chest-resonance at the same time. An 'open tone' I suppose is a kind of bawl like that of a ranting preacher or an uneducated singer." "How many registers are there and what is a register?" "That is a question that perplexes not by its difficulty, but because so many have darkened counsel by words without knowledge. The old Italian masters looked upon the registers as the different ranges of the voice in reference to the three resonance cavities: (i) the low range or chesttones, main resonance in the windpipe; (2) the medium range or register, main resonance in the mouth and pharynx and (3) the highest range or register with its main resonance in the post-nasal tube. I suppose the name came from the grand organ where a set of pipes of a particular quality is governed by pulling a stop that admits or shuts off air and is called a register. There are some that say there are no registers. It is true that the transitions ought not to be observed, but there are in every voice the chest, the medium and the head-registers or resonances. But there ought to be no breaks as geographical dividing lines, to define one part of the range from another. In a cultivated voice they are so smoothed over as not to be noticed. There must be an even chain of tones from the lowest to the highest. It is the teacher's part to see to it that the chest and the medium registers are not carried too high. The registers must be trained downward rather than upward." "Who was your instructor and who are some of your pupils?" "The man to whom I owe the most was Rudolph Otto, in his days a famous concert-singer of Berlin and the tenor soloist of the Dom-chor of the same city. His was a voice not naturally powerful or beautiful. It was all art with him and he sang with the most exquisite taste. Of what school was he? He was an adherent of the Old Italian School of voice culture. Is there a French, German or Italian school other than the difference in the language? In these days of the contact of nations in travel there is no national school of singing. There are good teachers and poor ones in Paris, Milan and Berlin, and the good ones arrive at much the same results. "As to my pupils I have been unfortunate in that so many of them have married and withdrawn from the profession. Laura Bellini was a pupil of mine. So was Fred Harvey, who sang with Leopold Damrosch and Theodore Thomas as solo tenor. Miss Belle Watson, Miss Lydia Starritt, who was with Aronson in the 'Fencing-Master,' Miss Mary Lancaster, Miss Edith Tuttle, who has been contralto soloist of St. Paul's chapel choir since 1884." [Mr. Kofler has been the organist and choirmaster of St. Paul's chapel since 1877. One of the features of the musical arrangements there is the volunteer choir. There are two solo quartets and the volunteer chorus and all the volunteer members receive a private lesson weekly in the cultivation of the voice. The more advanced members of the volunteer choir may be selected for the salaried positions; if they are fitted for it solos are given them to encourage them to work harder and take a greater interest in their studies. It is Mr. Kofler's experience that there are more women than men studying vocal culture and that the women are more diligent and persevering. The men are mostly in business and hope to attain the point where they may give up trade and devote themselves solely to singing for a living, but it is haid for them to spare the time from the office to take lessons and they hate to give up their evenings and the possibilities of amusement. Most of Mr. Kofler's pupils expect to become professionals, for the unvarying question is: "Do you think I can do anything with my voice? " and to "do anything with a voice " means to make money with it. "I can detect the faults of pronunciation in English-speaking people as well as if it were my native tongue. I have gone into the subject of speechdefects quite considerably and my ear notes the slurring over of the consonants at once. My own English was acquired after I was a man and very few are able to speak another language than the one learned in childhood without an accent, even though they observe the slovenly speech of others and are able to tell the pupil what to do to overcome the error." "Is it necessary to go to Europe to study singing?" "Europe has this advantage: It is a great deal cheaper. You get more education for the same money there than here. Living is less costly there; there is more time to study, because the student does not know the language and must put in the time attending to his studies. He has no friends to visit and waste time on. He has no social duties. He can not fritter away his energies on making money, for there is no money to be made there by a beginner. As to the value of the teaching, there are as many humbugs and incompetents there as here. What hinders progress here is the fact that pupils, particularly ladies, get together and all talk at once. In one afternoon the good results of months of teaching are counteracted. When each tries to out-talk the other, good-bye throat!" "What is the best instrument to use in giving lessons? What do you think of the violin for that purpose?" "The piano is the most convenient for private lessons for the adult. For choruses of children, the violin is the best thing. If you take the tone and put it right into the ear with the violin, ee-ee-ee, they can't miss it." "Have associations helped the profession of vocal teaching?" "Oh, decidedly. It is a great advantage to teachers to get together and become acquainted with one another. Each finds out that the other is not such a fiend as he thought he was. Enmity thrives on ignorance of our neighbors. One finds out that they are pretty good fellows and are honestly trying to do good work. Each learns from the other and none knows so much that he can not learn more. By working together financial interests are improved and the whole profession is benefited. It is the Scripture over again: 'A house divided against itself can not stand.'" "Does the vocal profession offer to a man as good opportunities as the professions of medicine, law and the like, or even a mercantile life?" ''I really could not say. It is something to be able to make a living doing what one loves to do. There are some very successful men in the vocal profession, but the majority are not distressed by having more money than they know what to do with. There is room at the top, but only for a very few." "What songs and what vocalises do you give?" "Sieber's, Concone's and Bonaldi's exercises and many others. Songs? The greatest variety that are suitable, English, French, German. Italian, whatever is fit to be used." "The head-register has its resonance in the post-nasal tube and you want to feel it under the base of the skull and in the back of the head. Now take a full breath, retain it a little while, and then stoop gradually over and sing." "Certainly it can. But it is for the pupil to do. How? One must hear music, not the interpretation of those that know no more than the pupil, not mere piano-playing, but orchestral music, symphony concerts and operas. One should look over beforehand the music that is to be played and think how it should be interpreted and then listen carefully and see how others do it." It is the commonest accusation in the world against singing-teachers, and indeed musicians generally, that they are an ignorant lot of men. "Oh, yes, he understands music all right," they say, "but take him outside of that "and they shake their heads and add some remark about a last year's bird's nest. There is some excuse for musicians not being highly educated, for the art is so exacting that the years of youth, when the rest of us are studying "mensa, mensae," must be given up to weary hours at the piano. Most musicians find that life is all too short to acquire a working knowledge of their profession and know better than all others how true it is that "Art is long and Time is fleeting." Mr. Kofler has the advantage of most in this way: He can not remember when he could not play the organ, for his father had charge of the music of the cathedral church at Brixen in the Tyrol, and the boy had to help him with that and the two other churches in the same square. Also, the career mapped out for him by his parents was such that he had to learn Latin and if he can not carry on a conversation in that language now, it is because he has forgotten it. But he is a learned man after the pattern of the old scholasticism and one does not talk long with him before finding out that he has something to say in the light of the newer learning. A rather interesting thing about Mr. Kofler's book on "The Art of Breathing" is that it was written in English by a man whose mothertongue is German; that it contains a most careful study of vowel and consonantal sounds and that after having attained prominence among English-speaking students of the vocal art, it was translated into German in Germany purely on account of its value and without suggestion on the part of Mr. Kofler. Other treatises on this subject have commonly passed through the reverse process. Note: Leo Kofler was one the big Kahunas at the beginning of the 20th century in terms of his influence on vocal pedagogy, his book "The Art of Breathing" having a wide impact on the teaching of voice. My next post will feature his earlier work, which focused on the lineage and teaching of the Old Italian School.